James Savage, A Genealogical Dictionary or The first Settlers of New England showing Three Generations or Those who came Before May, 1692 on the Basis of Farmer's Register, (1862) , vol. 1, p. 260. Thomas W. Baldwin, Vital Records of Cambridge, Massachusetts, to the year 1850, Boston: Wright & Potter Print. Co., (1914) , Vol. 1, p. 244. 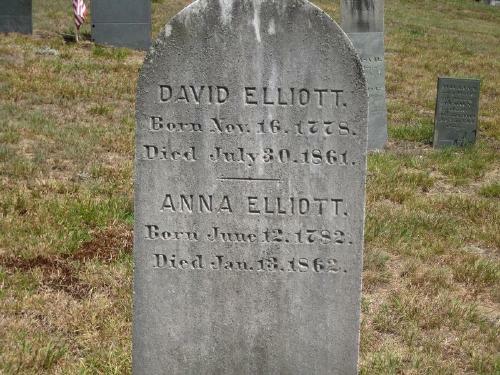 Concord, Massachusetts Births, Marriages, and Deaths 1635-1850, , at https://books.google.com/books?id=vs8UAAAAYAAJ . Boston: Beacon Press, ([1891?]) , p. 15. Concord, Massachusetts Births, Marriages, and Deaths 1635-1850, , at https://books.google.com/books?id=vs8UAAAAYAAJ . Boston: Beacon Press, ([1891?]) , p. 89. Hannah Edson was born perhaps about 1710. John Edson was born perhaps about 1720. "New Hampshire, Death Records, 1654-1947," index and images, FamilySearch (https://familysearch.org/pal:/MM9.1.1/FSVD-3DS : accessed 05 Nov 2012), Aurilla Ordway, 01 Feb 1902. "New Hampshire Birth Records, Early to 1900," database with images, FamilySearch (https://familysearch.org/ark:/61903/1:1:FLLG-5B1 : 12 December 2014), Cora Bell Elliott, Jan 1890; citing Hooksett, Merrimack, New Hampshire, United States, Bureau of Vital Records and Health Statistics, Concord; FHL microfilm 1,000,499. 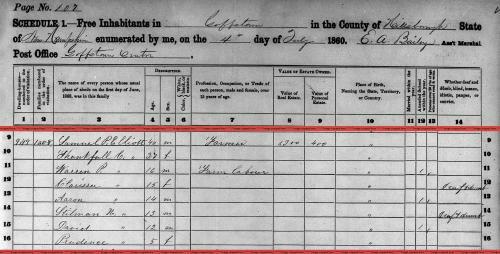 "United States Census, 1900," database with images, FamilySearch (https://familysearch.org/ark:/61903/1:1:M3Y6-C27 : 20 January 2015), William B Elliott, Hooksett town, Merrimack, New Hampshire, United States; citing sheet 12A, family 257, NARA microfilm publication T623 (Washington, D.C.: National Archives and Records Administration, n.d.); FHL microfilm 1,240,949. Find A Grave Memorial# 55727394. New Hampshire Births and Christenings, 1714-1904, at https://beta.familysearch.org/s/collection/show#uri=http%3A%2F%2Fpilot.familysearch.org%2Frecords%2Ftrk%3A%2Ffsrs%2Fc1680836&hash=HloWXpZgU9zB10k5M56iYku8TUc%253D, FHL Film Number: 15553. New Hampshire Statewide Marriage Records 1637-1947,, Concord: New Hampshire Bureau of Vital Records and Health Statistics, , FHL Film Number: 1000988. Find A Grave Memorial# 55727251. "New Hampshire, Marriage Records, 1637-1947," index and images, FamilySearch (https://familysearch.org/pal:/MM9.1.1/FLFV-QLB : accessed 24 Nov 2012), David S. Elliott and Martha J. Bartlett and null, 1877. "New Hampshire, Death Records, 1654-1947," index and images, FamilySearch (https://familysearch.org/pal:/MM9.1.1/FSJZ-7QZ : accessed 24 Nov 2012), David L. Elliott, 04 Jul 1902. 1880 United States. Census Office. 10th census, 1880 federal population census, Washington, District of Columbia: National Archives and Records Service, ([19--]) , FHL Film 1254762; National Archives Film T9-0762; Page 299A. "New Hampshire, Marriage Records, 1637-1947," index and images, FamilySearch (https://familysearch.org/pal:/MM9.1.1/FLFV-QL2 : accessed 24 Nov 2012), David S. Elliott and Mary E. Preston and null, 1885. "United States Census, 1900," database with images, FamilySearch (https://familysearch.org/ark:/61903/1:1:M3Y8-DRN : 20 January 2015), David S Elliott, Andover town, Merrimack, New Hampshire, United States; citing sheet 5B, family 130, NARA microfilm publication T623 (Washington, D.C.: National Archives and Records Administration, n.d.); FHL microfilm 1,240,949. David Webster, 1833- Hoyt, The old families of Salisbury and Amesbury Massachusetts : with some related families of Newbury, Haverhill, Ipswich, and Hampton, and of York County, Maine / David W. Hoyt., Page: 1097 p. ; 23 cm. (n.p. : Genealogical Publishing Co., Baltimore, 1982, unknown publish date), p. 110. "Massachusetts Births and Christenings, 1639-1915," database, FamilySearch (https://familysearch.org/ark:/61903/1:1:FHLB-126 : 4 December 2014), Eliza. Elliot, 11 Nov 1691; citing Amsbury, Essex, Massachusetts, ; FHL microfilm 877,468. 1880 United States. Census Office. 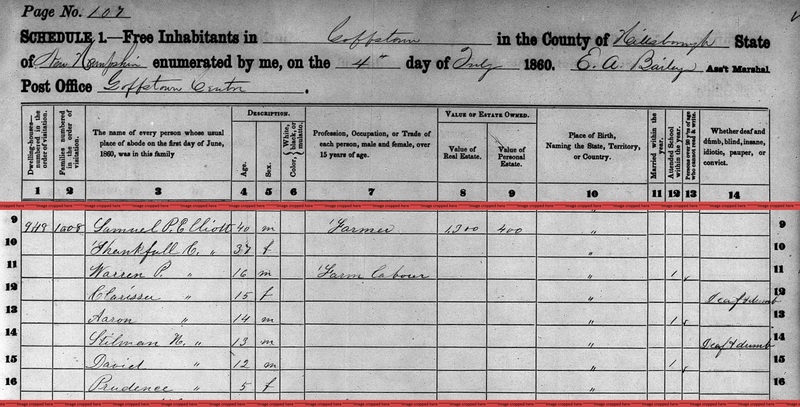 10th census, 1880 federal population census, Washington, District of Columbia: National Archives and Records Service, ([19--]) , Supvr's Dist: 82, Enum Dist: 162. Page: 8. Line: 14. Dwelling: 90. Family: 94. Priscilla Hammond, The town book of Bow,New Hampshire, (1933) , p. 277.